can i just say i adore me some demaris? obvi, since dw is originally from KY we rooted for her. 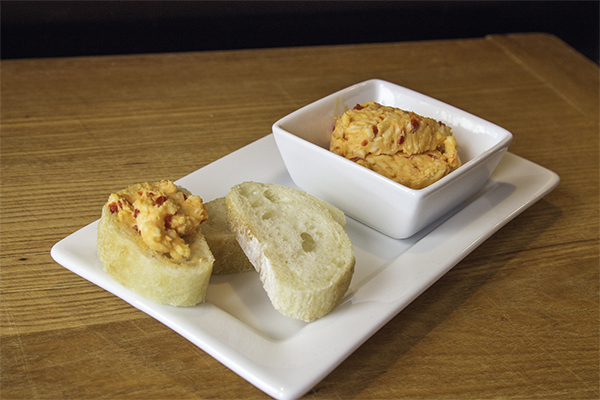 anyway, pimento cheese is something i can’t have for real but i would love to somehow doctor it where i can have it. i found a vegan cream cheese that i absolutely love (i realize that sounds gross to some people) and cabot cheese is lactose free. which leaves the gouda. what’s that do for the mixture, or can i double up on the cheddar or cream cheese? Demaris was my pick from the get go. Love, love, love her and in my dream world she and I are besties. I can’t say that you’d go wrong to double down on the cheddar in place of gouda. Maybe do 8oz sharp cheddar and 8oz mild. You know my philosophy…do what works for you. I served this all griddled up between some bread accompanied by tomato soup and Miss D’s pineapple upside down cake. The simplicity of it all is brilliant.